Korean pop idols Hero Jaejoong, Micky Yoochun and Xiah Junsu, three members of boy band TVXQ who formed a new unit since getting involved in a legal battle with agency SM Entertainment, gave a sold-out concert in Japan over the weekend. According to a report by Japanese newspaper Sankei Sports, the trio performed their last show of their two-city, four-gig concert tour in the country in front of some 54,000 fans who showed up Sunday at Tokyo Dome. The four shows reportedly attracted a total of 200,000 fans. During the concert, whose setlist was comprised of a total of eighteen songs, the three singers broke into tears while performing their new track "W."
"I want to keep on singing with a pure heart. Thank you forever," Hero Jaejoong was quoted as saying at the show. 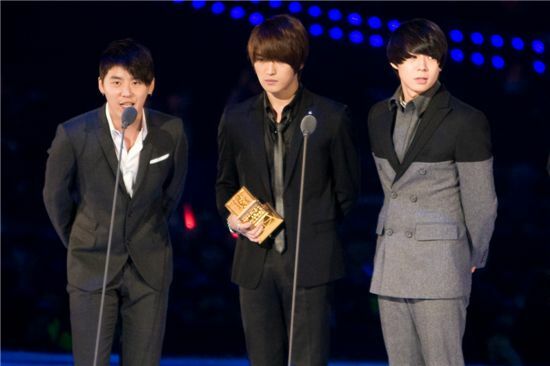 Bandmate Micky Yoochun thanked fans saying, "We were very worried if we could perform on stage again. We were able to get here because of you." Last July, the three singers had asked a court to nullify their 13-year exclusive contract with SM, claiming that the contract period is too long. The legal dispute led to the mega-successful boy band halting their activities as a five-member group, who officially quit working as a group in Korea last year and later in Japan as well. Arguably the most phenomenal K-pop act created by talent agency SM Entertainment, the TVXQ had enjoyed great success throughout Asia and the Japanese music industry in particular. Last year, they became the first foreign artist to top the Oricon singles charts six times and placed their single and album simultaneously within the top three slots of Oricon's singles and albums chart, the first time for a foreign artist to do so in 15 years. Although the group's legal woes did little to wane their popularity among fans, the five members have been going their separated ways with Hero, Micky and Xiah forming a new group through which they will continue their music careers. The trio are set to release a documentary DVD on July 28 and appear at music festival "a - nation'10" to be held in Osaka and Tokyo starting August 7. Two other members, leader U-Know Yunho and Max Changmin, have ventured into acting with starring roles in upcoming musical production of "Goong" and television drama "Paradise Ranch," respectively.